Chief Deputy Jon Scowden, left, poses with Delaware County Sheriff Russell Martin. Scowden, a Delaware native, is the department’s newest chief deputy. Scowden said he was born and raised in Delaware County and graduated from Buckeye Valley High School before heading to The Ohio State University and ultimately, to the police academy. Scowden said he worked a brief stint as a police officer in Powell but spent the past 25 years at the Westerville Police Department. 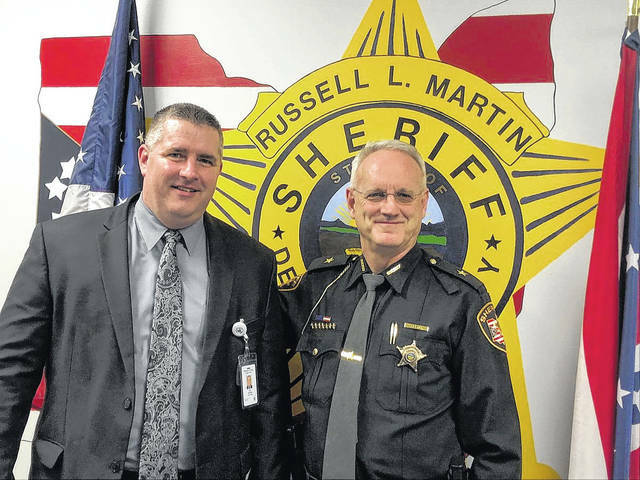 Delaware County Sheriff Russell Martin said he has known Scowden for many years and offered him the job of chief deputy for the Delaware County Sheriff’s Office after the position became vacant last year. Scowden said Westerville was “an awesome department” but said he could not turn down the chance to come back home to Delaware. Martin said Scowden is one of three chief deputies at the department and will oversee the patrol division of the sheriff’s office. Martin praised work Scowden did in Westerville when he helped lead an initiative to educate autistic individuals on how to interact with the police and vice versa. Scowden said he has a son who has high-functioning autism and considered what would happen if his son was stopped by a police officer while he was driving. “How would he react? How would that police officer interact with him, because I know the communication disability that there is there?” Scowden said. Scowden said he knows there’s a difference between municipal law enforcement and county law enforcement and said he’s excited to learn and be part of the Delaware County community. https://www.delgazette.com/wp-content/uploads/sites/40/2018/03/web1_Scowden.jpgChief Deputy Jon Scowden, left, poses with Delaware County Sheriff Russell Martin. Scowden, a Delaware native, is the department’s newest chief deputy.